Spurs head coach and noted curmudgeon Gregg Popovich must’ve had someplace else he needed to be Wednesday night. At the 10:57 mark of the first quarter of his team’s game against the Denver Nuggets—just 63 seconds after tipoff—Popovich was hit with a double-technical and ejected. 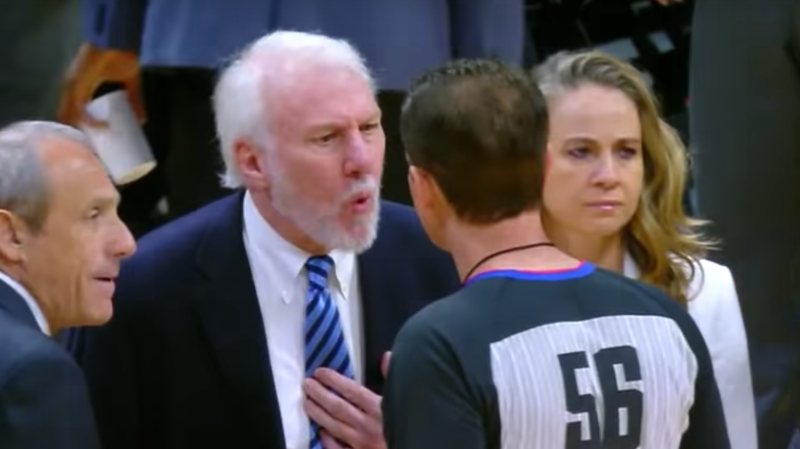 This is the second time old man Popovich has been bounced in San Antonio’s last three games, after he lost his mind at officials in Sunday’s loss to the Kings. That time he at least stuck it out until the third quarter! On the other hand, by getting his ejection out of the way early Wednesday night he spared himself a lot of misery—the Nuggets led wire to wire, and by as many as 30 points, and held the Spurs to a season-low 85 points. Who the hell wants to watch that mess? Clearly the right move. UC Irvine Coach Says He Called Oregon&apos;s Louis King "Queen" To Rattle Him But Also Because Of Chess?